The Ordnance Quick-Firing 6-pounder 7 cwt, or just 6 pounder, was a British 57 mm gun, their primary anti-tank gun during the middle of World War II, as well as the main armament for a number of armoured fighting vehicles. It was first used in North Africa in April 1942, and quickly replaced the 2 pounder in the anti-tank role, allowing the 25 pounder to revert to its intended artillery role. 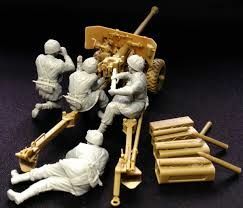 The United States Army also adopted the 6 pdr as their primary anti-tank gun under the designation 57 mm Gun M1. The gun was further used for a variety of other uses including MTBs and for the 'Tse-Tse' Mosquito. Post war it was used my many military arms and is still in some limited use today. Here is another great artillery piece from the folks at Bronco. This time their 6 pnd gun is on a carriage that was often used by paratroopers. This basically meant smaller wheels and a somewhat lighter gun as it had to be capable of being carried in a glider. A few interesting notes on this one. It is designed to actually have a round in the breech if you so wish. The gun can also be moved back an d forth on its mount. 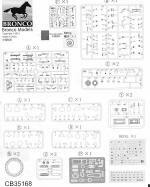 A fully detailed breech as well as azimuth and elevation gears and wheels are included. The shield is very nicely molded and as yhou'd expect, has quite a few small brackets on it, many of them part of the photo etch fret. The gun is designed to move in both azimuth and elevation. The Trails are separate pieces and also designed to be able to be posed either in action or in the travel mode. In the latter position, the aft half can be folded forward to reduce the space. The kit comes with a complete crew including a loader, aimer, spotter and an assistant loader. Plus you get ammunition boxes as well as individual rounds. 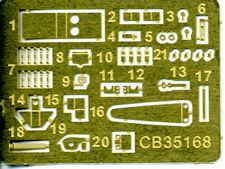 Instructions are very nicely done and include detail images to help you get things properly aligned. The only color offered for the gun is overall British drab. Full painting guides are provided for the figures as well. 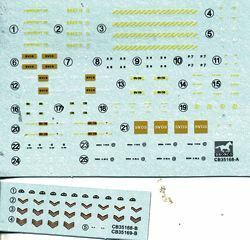 There are decals for both the figures and for the ammo boxes and shells. 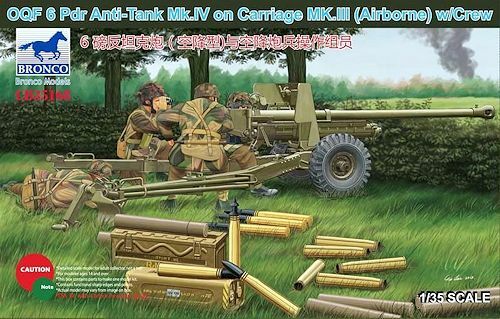 A very nice kit for those who like artillery or anti-tank guns. The inclusion of the Mk.III carriage makes this one a bit different from the other 6 pounder kits that are on the market. Thanks to If you would like your product reviewed fairly and fairly quickly, please contactthe editor or see other details in the Note toContributors.